One of my favorite trends this season is velvet. I love velvet dresses, pants, jackets and shoes. I picked up this adorable velvet dress at one of my all time favorite boutiques, Blush. It is originally a Los Angeles based store but has just opened its doors in the OC. Welcome Blush Boutique in Laguna Hills. You must check it out!!!! I literally could have one of everything in this adorable store. And this velvet dress is one of my new favorite pieces. Don't you just love this color? 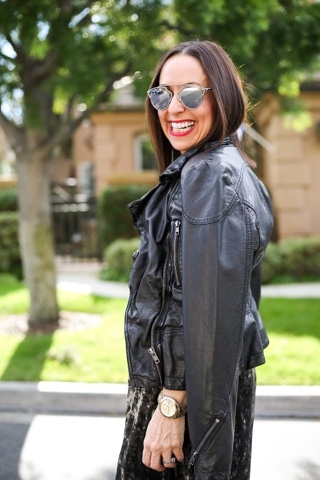 I paired it with this great faux leather moto jacket that I put over my shoulder. It is such a chic way to wear your same old jacket. I added some Matisse booties, my new favorite sunnies and some Miranda Frye jewelry. I completed this look with a bold red lip!!! I hope you add some fun velvet into your life. And don't forget to check out Blush Boutique in Laguna Niguel when you are in the OC!!! You can shop this look by clicking on the links above!!! Thanks to @photobyvincent for such an amazing time and these fabulous photos!!! Happy reading!!! !